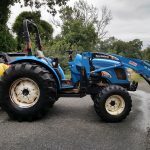 For Sale: New Holland TC55D tractor, 4WD with hydraulic shuttle drive. Includes 18L loader attachment with quick-attach (skid-steer) bucket. Also has forklift attachment for loader. Cima 300l sprayer with 4+4 spray heads (low & high). Also includes tree cannon for orchard spraying. 72” brush hog mower.